Humans are the product of their genes and their environment. While we often consider the genetic side of the equation, what about the buildings we reside in or waltz by on a daily basis? It turns out that architectural design can have various effects on the way we think, feel and behave. This derives from a relatively new field of research known as architectural psychology (often described as a branch of environmental psychology), which explores the interaction between humans and the built environment. Renowned psychologists such as Dr. Colin Ellard have shown through several research studies that the built environment can have positive and negative effects on mental health and overall well-being. For example, he found that participants showed the highest levels of positive mood when visiting a green space on a New York City tour. As more research pours out from the field, teams of architects, designers and scientists are working together to construct buildings that take our health into account. From lighting and wall color to windows and green spaces, there are a staggering number of elements that play a major role in human psychology. To illustrate, we created an infographic that focuses on the positive effects of building design on human beings. Modern architecture has come a long way from the iconic, yet disastrous Pruitt-Igoe housing project in St. Louis. It’s hard to determine if there’s such thing as a ‘perfect’ building, but architects and urban planners are quickly tuning into how their designs may impact other people. Whether you’re an architect or simply an inhabitant, there are a handful of tips to keep in mind to ensure you’re at your happiest and healthiest self amongst the built environment. For starters, having direct access to nature is key to overall happiness and well-being. Not only do large windows provide views of the great outdoors, but they also allow plentiful sunshine to seep through, and natural light plays a major role in psychological comfort. Given we spend approximately 87 percent of our time indoors, close proximity to urban parks and other natural environments can also provide a healthy escape from being cooped up inside all day. 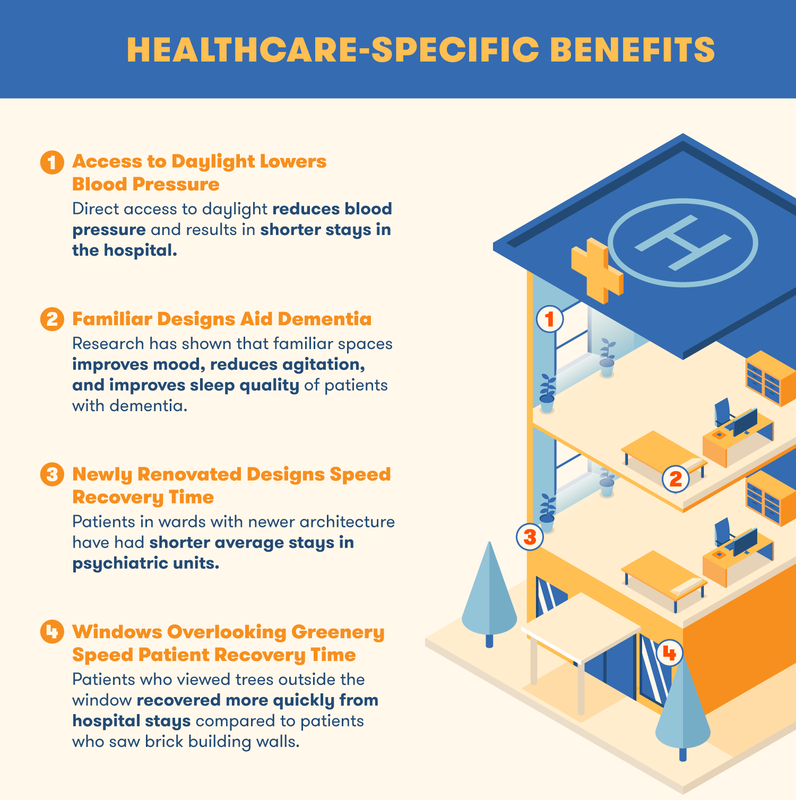 In addition to a wealth of psychological benefits, there are several healthcare-specific benefits to consider in relation to building design. Once again, having access to nature can directly influence the way people feel, going so far as speeding up patient recovery time in multiple research studies. If you or a loved one find yourselves staying in the hospital, make sure that your room has large, open windows with views of trees and the open sky rather than the exterior of another building. You’ll also want to consider choosing a hospital with a renovated, more modern aesthetic to further shorten your stay as well as green building renovations to improve the overall atmosphere. Overall, there are a host of factors and combinations to consider when it comes to architectural design. As more research is carried out, what’s deemed successful architectural design will continue to evolve, hopefully fostering a healthier, more human-centric environment.